The latest magazine scans have revealed our first look at the Raiden Kyoryuzin. 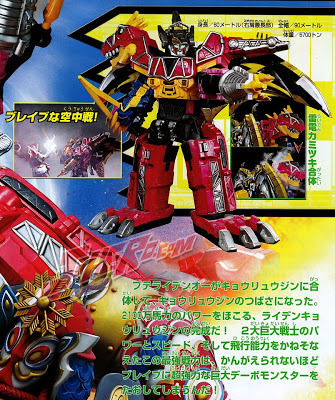 Raiden Kyoryuzin is formed using Kyoryuzin and PteraidenOh. Further details will be posted on when this form will debut on upcoming episodes of Zyuden Sentai Kyoryuger.